As a luxury real estate marketing professional you understand the importance of great packaging. One of the ways to upgrade that packaging is to add an unexpected element to your marketing materials. It may seem at first glance incongruous. However, it can trigger word-of-mouth advertising or buzz when you startle people with the unexpected element. We were in our wine store today, The Carpinteria Wine Company, and we saw the bottle pictured above with a placard stating it had a 90+ rating. That message drew us in, and we took a closer look at the wine. From a distance, it looked like any other bottle of wine. Up close, we noticed that it had a piece of the vine it originated from tied in raffia on the front of the bottle. Instantly, it became unforgettable. The wine happens to be great! But, the next time we go back to the wine store we can find it in a nano-second without even remembering the name of the wine. That is brilliant marketing and branding! In a previous post, we mentioned that, given the enormous competition in the wine market, it is understandable why a wine label design can cost up to $80,000. This added unexpected element costs, next to nothing because the vines are trimmed and burned every year after the harvest. This is one of the best examples of how you can out-think, not out-spend your competition and become the standout in your marketplace. 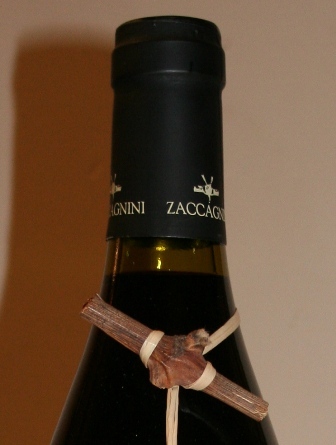 The name of the wine is Cantina Zaccagnini, Montepulciano d"Abruzzo 2007. That is certainly not an easy name to remember, but the packaging is. Happy Sipping!